The Constitution of India (IAST: Bhāratīya Saṃvidhāna) is the supreme law of India. The document lays down the framework demarcating fundamental political code, structure, procedures, powers, and duties of government institutions and sets out fundamental rights, directive principles, and the duties of citizens. It is the longest written constitution of any country on earth. [b] B. R. Ambedkar, chairman of the drafting committee, is widely considered to be its chief architect. It imparts constitutional supremacy (not parliamentary supremacy, since it was created by a constituent assembly rather than Parliament) and was adopted by its people with a declaration in its preamble. [full citation needed] Parliament cannot override the constitution. The constitution declares India a sovereign, socialist, secular, democratic republic, assuring its citizens justice, equality and liberty, and endeavours to promote fraternity. The original 1950 constitution is preserved in a helium-filled case at the Parliament House in New Delhi. The words "secular" and "socialist" were added to the preamble in 1976 during the emergency. Most of the Indian subcontinent was under British rule from 1857 to 1947. 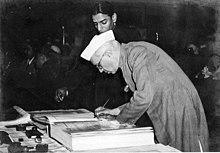 From 1947 to 1950, the same legislation continued to be implemented as India was a dominion of Britain for these three years, as each princely state was convinced by Sardar Patel and V.P.Menon to sign the articles of integration with India, and the British government continued to be responsible for the external security of the country. Thus, the constitution of India repealed the Indian Independence Act 1947 and Government of India Act, 1935 when it became effective on 26 January 1950. India ceased to be a dominion of the British Crown and became a sovereign democratic republic with the constitution. Articles 5, 6, 7, 8, 9, 60, 324, 366, 367, 379, 380, 388, 391, 392, 393, and 394 of the constitution came into force on 26 November 1949, and the remaining articles became effective on 26 January 1950. The constitution was drawn from a number of sources. Mindful of India's needs and conditions, its framers borrowed features of previous legislation such as the Government of India Act 1858, the Indian Councils Acts of 1861, 1892 and 1909, the Government of India Acts of 1919 and 1935, and the Indian Independence Act 1947. The latter, which led to the creation of India and Pakistan, divided the former Constituent Assembly in two. Each new assembly had sovereign power to draft and enact a new constitution for the separate states. The constitution was drafted by the Constituent Assembly, which was elected by elected members of the provincial assemblies. The 389-member assembly (reduced to 299 after the partition of India) took almost three years to draft the constitution holding eleven sessions over a 165-day period. "Mr. President, Sir, I am one of those in the House who have listened to Dr. Ambedkar very carefully. I am aware of the amount of work and enthusiasm that he has brought to bear on the work of drafting this Constitution. At the same time, I do realise that that amount of attention that was necessary for the purpose of drafting a constitution so important to us at this moment has not been given to it by the Drafting Committee. The House is perhaps aware that of the seven members nominated by you, one had resigned from the House and was replaced. One died and was not replaced. One was away in America and his place was not filled up and another person was engaged in State affairs, and there was a void to that extent. One or two people were far away from Delhi and perhaps reasons of health did not permit them to attend. So it happened ultimately that the burden of drafting this constitution fell on Dr. Ambedkar and I have no doubt that we are grateful to him for having achieved this task in a manner which is undoubtedly commendable." Time Line of Formation of "The Constitution of India"
13 December 1946: An 'Objective Resolution' was presented by Jawaharlal Nehru, laying down the underlying principles of the constitution. which later became the Preamble of the constitution. 22 January 1947: Objective resolution unanimously adopted. 22 July 1947: National flag adopted. 15 August 1947: Achieved independence. India Split into Dominion of India and Dominion of Pakistan. 16 July 1948: Along with Harendra Coomar Mookerjee V. T. Krishnamachari was also elected as second vice-president of Constituent Assembly. 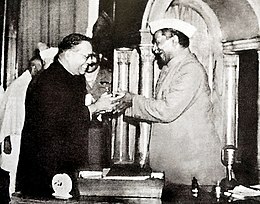 26 November 1949: 'Constitution of India' passed and adopted by the assembly. G. V. Mavlankar was the first speaker when meeting the assembly of Lok sabha, after turning republic. B. R. Ambedkar, Sanjay Phakey, Jawaharlal Nehru, C. Rajagopalachari, Rajendra Prasad, Vallabhbhai Patel, Kanaiyalal Maneklal Munshi, Ganesh Vasudev Mavalankar, Sandipkumar Patel, Abul Kalam Azad, Shyama Prasad Mukherjee, Nalini Ranjan Ghosh, and Balwantrai Mehta were key figures in the assembly, which had over 30 representatives of the scheduled classes. Frank Anthony represented the Anglo-Indian community, and the Parsis were represented by H. P. Modi. Harendra Coomar Mookerjee, a Christian assembly vice-president, chaired the minorities committee and represented non-Anglo-Indian Christians. Ari Bahadur Gurung represented the Gorkha community. 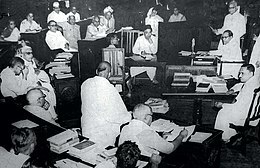 Judges, such as Alladi Krishnaswamy Iyer, Benegal Narsing Rau, K. M. Munshi and Ganesh Mavlankar were members of the assembly. Female members included Sarojini Naidu, Hansa Mehta, Durgabai Deshmukh, Amrit Kaur and Vijaya Lakshmi Pandit. The first, two-day president of the assembly was Sachchidananda Sinha; Rajendra Prasad was later elected president. It met for the first time on 9 December 1946. Benegal Narsing Rau, a civil servant who became the first Indian judge in the International Court of Justice and was president of the United Nations Security Council, was appointed as the assembly's constitutional adviser in 1946. Responsible for the constitution's general structure, Rau prepared its initial draft in February 1948. At 14 August 1947 meeting of the assembly, committees were proposed. Rau's draft was considered, debated and amended by the eight-person drafting committee, which was appointed on 29 August 1947 with B. R. Ambedkar as chair. A revised draft constitution was prepared by the committee and submitted to the assembly on 4 November 1947. While deliberating the revised draft constitution, the assembly moved, discussed and disposed off 2,473 amendments out of a total of 7,635. Before adopting the constitution, the assembly held eleven sessions in 165 days. On 26 November 1949 it adopted the constitution, which was signed by 284 members. The day is celebrated as National Law Day, or Constitution Day. The day was chosen to spread the importance of the constitution and to spread thoughts and ideas of Ambedkar. The assembly's final session convened on 24 January 1950. Each member signed two copies of the constitution, one in Hindi and the other in English. The original constitution is hand-written, with each page decorated by artists from Shantiniketan including Beohar Rammanohar Sinha and Nandalal Bose. Its calligrapher was Prem Behari Narain Raizada. The constitution was published in Dehradun and photolithographed by the Survey of India. Production of the original constitution took nearly five years. Two days later, on 26 January 1950, it became the law of India. The estimated cost of the Constituent Assembly was ₹6.3 crore (₹63 million). The constitution has had more than 100 amendments since it was enacted. The Indian constitution is the world's longest for a sovereign nation. [b] At its enactment, it had 395 articles in 22 parts and 8 schedules. At about 145,000 words, it is the second-longest active constitution – after the Constitution of Alabama – in the world. The constitution has a preamble and 448 articles,[c] which are grouped into 25 parts. [d] With 12 schedules[e] and five appendices, it has been amended 103 times; the latest amendment became effective on 14 January 2019. Fifth Schedule (Article 244(1)) – Provides for the administration and control of Scheduled Areas[f] and Scheduled Tribes[g] (areas and tribes requiring special protection). The executive, legislative and judicial branches of government receive their power from the constitution and are bound by it. With the aid of its constitution, India is governed by a parliamentary system of government with the executive directly accountable to the legislature. The President of India is head of the executive branch, under Articles 52 and 53, with the duty of preserving, protecting and defending the constitution and the law under Article 60. Article 74 provides for a Prime Minister as head of the Council of Ministers, which aids and advises the president in the performance of their constitutional duties. The council is answerable to the lower house under Article 75(3). The constitution is considered federal in nature, and unitary in spirit. It has features of a federation (a codified, supreme constitution, a three-tier governmental structure [central, state and local], division of powers, bicameralism and an independent judiciary) and unitary features such as a single constitution, single citizenship, an integrated judiciary, a flexible constitution, a strong central government, appointment of state governors by the central government, All India Services (the IAS, IFS and IPS) and emergency provisions. This unique combination makes it quasi-federal in form. Each state and union territory has its own government. Analogous to the president and prime minister, each has a governor or (in union territories) a lieutenant governor and a chief minister. Article 356 permits the president to dismiss a state government and assume direct authority if a situation arises in which state government cannot be conducted in accordance with constitution. This power, known as president's rule, was abused as state governments came to be dismissed on flimsy grounds for political reasons. After the S. R. Bommai v. Union of India decision, such a course of action is more difficult since the courts have asserted their right of review. The 73rd and 74th Amendment Acts introduced the system of panchayati raj in rural areas and Nagar Palikas in urban areas. Article 370 gives special status to the state of Jammu and Kashmir. Amendments are additions, variations or repeal of any part of the constitution by Parliament. The procedure is detailed in Article 368. An amendment bill must be passed by each house of Parliament by a two-thirds majority of its total membership when at least two-thirds are present and vote. Certain amendments pertaining to the constitution's federal nature must also be ratified by a majority of state legislatures. Unlike ordinary bills in accordance with Article 245 (except for money bills), there is no provision for a joint session of the Lok Sabha and Rajya Sabha to pass a constitutional amendment. During a parliamentary recess, the president cannot promulgate ordinances under his legislative powers under Article 123, Chapter III. Deemed amendments to the constitution which can be passed under the legislative powers of parliament were invalidated by Article 368(1) in the Twenty-fourth Amendment. By July 2018, 124 amendment bills had been presented in Parliament; of these, 103 became Amendment Acts. Despite the supermajority requirement for amendments to pass, the Indian constitution is the world's most frequently-amended national governing document. The constitution is so specific in spelling out government powers that many amendments address issues dealt with by statute in other democracies. In 2000, the Justice Manepalli Narayana Rao Venkatachaliah Commission was formed to examine a constitutional update. The government of India establishes term-based law commissions to recommend legal reforms, facilitating the rule of law. In Kesavananda Bharati v. State of Kerala, the Supreme Court ruled that an amendment cannot destroy what it seeks to modify; it cannot tinker with the constitution's basic structure or framework, which are immutable. Such an amendment will be declared invalid, although no part of the constitution is protected from amendment; the basic structure doctrine does not protect any one provision of the constitution. According to the doctrine, the constitution's basic features (when "read as a whole") cannot be abridged or abolished. These "basic features" have not been fully defined, and whether a particular provision of the constitution is a "basic feature" is decided by the courts. This implies that Parliament can only amend the constitution to the limit of its basic structure. The Supreme Court or a high court may declare the amendment null and void if this is violated, after a judicial review. This is typical of parliamentary governments, where the judiciary checks parliamentary power. In its 1967 Golak Nath v. State of Punjab decision, the Supreme Court ruled that the state of Punjab could not restrict any fundamental rights protected by the basic structure doctrine. The extent of land ownership and practice of a profession, in this case, were considered fundamental rights. The ruling was overturned with the ratification of the 24th Amendment in 1971. The judiciary is the final arbiter of the constitution. Its duty (mandated by the constitution) is to act as a watchdog, preventing any legislative or executive act from overstepping constitutional bounds. The judiciary protects the fundamental rights of the people (enshrined in the constitution) from infringement by any state body, and balances the conflicting exercise of power between the central government and a state (or states). The courts are expected to remain unaffected by pressure exerted by other branches of the state, citizens or interest groups. An independent judiciary has been held as a basic feature of the constitution, which cannot be changed by the legislature or the executive. All pre-constitutional laws, if they conflict wholly or in part with the constitution, shall have all conflicting provisions deemed ineffective until an amendment to the constitution ends the conflict; the law will again come into force if it is compatible with the constitution as amended (the Doctrine of Eclipse). Laws made after the adoption of the constitution must be compatible with it, or they will be deemed void ab initio. In such situations, the Supreme Court (or a high court) determines if a law is in conformity with the constitution. If such an interpretation is not possible because of inconsistency (and where separation is possible), the provision which is inconsistent with the constitution is considered void. In addition to Article 13, Articles 32, 226 and 227 provide the constitutional basis for judicial review. Due to the adoption of the Thirty-eighth Amendment, the Supreme Court was not allowed to preside over any laws adopted during a state of emergency which infringe fundamental rights under article 32 (the right to constitutional remedies). The Forty-second Amendment widened Article 31C and added Articles 368(4) and 368(5), stating that any law passed by Parliament could not be challenged in court. The Supreme Court ruled in Minerva Mills v. Union of India that judicial review is a basic characteristic of the constitution, overturning Articles 368(4), 368(5) and 31C. According to Granville Austin, "The Indian constitution is first and foremost a social document, and is aided by its Parts III & IV (Fundamental Rights & Directive Principles of State Policy, respectively) acting together, as its chief instruments and its conscience, in realising the goals set by it for all the people. "[i] The constitution has deliberately been worded in generalities (not in vague terms) to ensure its flexibility. John Marshall, the fourth Chief Justice of the United States, said that a constitution's "great outlines should be marked, its important objects designated, and the minor ingredients which compose those objects be deduced from the nature of the objects themselves." A document "intended to endure for ages to come", it must be interpreted not only based on the intention and understanding of its framers, but in the existing social and political context. The "right to life" guaranteed under Article 21[A] has been expanded to include a number of human rights, including the right to a speedy trial,; the right to water; the right to earn a livelihood, the right to health, and the right to education. If the Indian constitution is our heritage bequeathed to us by our founding fathers, no less are we, the people of India, the trustees and custodians of the values which pulsate within its provisions! A constitution is not a parchment of paper, it is a way of life and has to be lived up to. Eternal vigilance is the price of liberty and in the final analysis, its only keepers are the people." —  Khanna, Hans Raj (2008). Making of India's constitution (2nd ed.). Lucknow: Eastern Book Co (published 1 January 2008). ISBN 978-81-7012-108-4. OCLC 294942170. ^ The Constitution of India was originally written in Hindi and English, so, both Hindi and English are its 'original' languages. ^ a b The Constitution of Yugoslavia briefly held this position from 1974 until it split up in 1990. ^ Although the last article of the constitution is Article 395, the total number in March 2013 was 465. New articles added through amendments have been inserted in the relevant location of the original constitution. To not disturb the original numbering, new articles are inserted alphanumerically; Article 21A, pertaining to the right to education, was inserted by the 86th Amendment Act. ^ The Constitution was in 22 Parts originally. Part VII & IX (older) was repealed in 1956, whereas newly added Part IVA, IXA, IXB & XIVA by Amendments to the Constitution in different times (lastly added IXB by the 97th Amendment). ^ By 73rd & 74th Amendment, the lists of administrative subjects of Panchayat raj & Municipality included in the Constitution as Schedule 11 & 12 respectively in the year 1993. ^ Scheduled Areas are autonomous areas within a state, administered federally and usually mainly populated by a Scheduled Tribe. ^ Art. 21 – "No person shall be deprived of his life or personal liberty except according to procedure established by law"
^ Original edition with original artwork - The Constitution of India. New Delhi: Government of India. 26 November 1949. Retrieved 22 March 2019. ^ "Preface, The constitution of India" (PDF). Government of India. Retrieved 5 February 2015. ^ a b c d e f g h i j k l m n o p q r s t u v w x y z aa ab ac ad Krithika, R. (21 January 2016). "Celebrate the supreme law". The Hindu. N. Ram. ISSN 0971-751X. OCLC 13119119. Retrieved 24 July 2018. ^ a b Pylee, Moolamattom Varkey (1994). 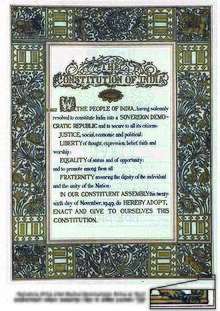 India's Constitution (5th rev. and enl. ed.). New Delhi: R. Chand & Company. p. 3. ISBN 978-8121904032. OCLC 35022507. ^ a b Nix, Elizabeth (9 August 2016). "Which country has the world's shortest written constitution?". History. A&E Networks. Retrieved 24 July 2018. ^ "The Constitution of India: Role of Dr. B.R. Ambedkar". Archived from the original on 2 April 2015. ^ "Constitutional supremacy vs parliamentary supremacy" (PDF). Retrieved 12 October 2015. ^ "Introduction to Constitution of India". Ministry of Law and Justice of India. 29 July 2008. Retrieved 14 October 2008. ^ Swaminathan, Shivprasad (26 January 2013). "India's benign constitutional revolution". The Hindu: opinion. Retrieved 18 February 2013. ^ Das, Hari (2002). Political System of India (Reprint ed.). New Delhi: Anmol Publications. p. 120. ISBN 978-8174884961. ^ WP(Civil) No. 98/2002 (12 September 2002). "Aruna Roy & Ors. v. Union of India & Ors" (PDF). Supreme Court of India. p. 18/30. Retrieved 11 November 2015. ^ "Preamble of the Constitution of India" (PDF). Ministry of Law & Justice. Retrieved 29 March 2012. ^ a b c d e f g h i j k l m n o p q r Dhavan, Rajeev (26 November 2015). "Document for all ages: Why Constitution is our greatest achievement". Hindustan Times. OCLC 231696742. Retrieved 24 July 2018. ^ a b c d e f g h i j k l m n Yellosa, Jetling (26 November 2015). "Making of Indian Constitution". The Hans India. Retrieved 24 July 2018. ^ a b c d "The Constituent Assembly Debates (Proceedings):(9th December,1946 to 24 January 1950)". The Parliament of India Archive. Retrieved 22 February 2008. ^ Laxmikanth, M. "INDIAN POLITY". McGraw-Hill Education. Retrieved 6 April 2019 – via Google Books. ^ DelhiNovember 26, India Today Web Desk New; November 26, 2018UPDATED:; Ist, 2018 15:31. 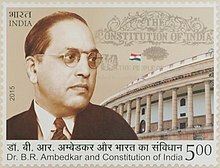 "Constitution Day: A look at Dr BR Ambedkar's contribution towards Indian Constitution". India Today. Retrieved 6 April 2019. ^ "Denying Ambedkar his due". 14 June 2016. Retrieved 6 April 2019. ^ "Constituent Assembly of India Debates". 164.100.47.194. Retrieved 6 April 2019. ^ a b Patnaik, Biswaraj (26 January 2017). "BN Rau: The Forgotten Architect of Indian Constitution". The Pioneer. Bhubaneswar: Chandan Mitra. Retrieved 24 July 2018. ^ On National Law Day, saluting two remarkable judges, Firstpost, 26 November 2011. ^ PM Modi greets people on Constitution Day, DNA India, 26 November 2015. ^ "November 26 to be observed as Constitution Day: Facts on the Constitution of India". India Today. 12 October 2015. Retrieved 20 November 2015. ^ "Original unamended constitution of India, January, 1950". Retrieved 17 April 2014. ^ "THE CONSTITUTION (AMENDMENT) ACTS". India Code Information System. Ministry of Law, Government of India. Retrieved 9 December 2013. ^ Bahl, Raghav (27 November 2015). "How India Borrowed From the US Constitution to Draft its Own". The Quint. Retrieved 24 July 2018. ^ Sridhar, Madabhushi. "Evolution and Philosophy behind the Indian Constitution (page 22)" (PDF). Dr.Marri Channa Reddy Human Resource Development Institute (Institute of Administration), Hyderabad. Retrieved 22 October 2015. ^ Lockette, Tim (18 November 2012). "Is the Alabama Constitution the longest constitution in the world?Truth Rating: 4 out of 5". The Anniston Star. Josephine Ayers. Retrieved 24 July 2018. ^ "Constitution of india". Ministry of Law and Justice, Govt. of India. ^ "NOTIFICATION" (PDF). egazette.nic.in. Retrieved 16 January 2019. ^ Baruah, Aparijita (2007). Preamble of the Constitution of India: An Insight and Comparison with Other Constitutions. New Delhi: Deep & Deep. p. 177. ISBN 81-7629-996-0. Retrieved 12 November 2015. ^ Chishti, Seema; Anand, Utkarsh (30 January 2015). "Legal experts say debating Preamble of Constitution pointless, needless". The Indian Express. Retrieved 12 November 2015. ^ "Forty-Second Amendment to the Constitution". Ministry of Law and Justice of India. 28 August 1976. Retrieved 14 October 2008. ^ a b Menon, N.R. Madhava (26 September 2004). "Parliament and the Judiciary". The Hindu. Retrieved 21 November 2015. ^ M Laxmikanth. "3". Indian Polity (4th ed.). McGraw Hill Education. p. 3.2. ISBN 978-1-25-906412-8. ^ Krishnakumar, R. "'Article 356 should be abolished'". Frontline (Vol. 15 :: No. 14 :: 4–17 July 1998). Retrieved 9 November 2015. ^ Rajendra Prasad, R.J. "'Bommai verdict has checked misuse of Article 356'". Frontline (Vol. 15 :: No. 14 :: 4–17 July 1998). Retrieved 9 November 2015. ^ Swami, Praveen. "Protecting secularism and federal fair play". Frontline (Vol. 14 :: No. 22 :: 1–14 Nov. 1997). Retrieved 9 November 2015. ^ a b "Pages 311 & 312 of original judgement: A. K. Roy, Etc vs Union Of India And Anr on 28 December, 1981". Retrieved 23 August 2014. ^ Krishnamurthi, Vivek (2009). "Colonial Cousins: Explaining India and Canada's Unwritten Constitutional Principles" (PDF). Yale Journal of International Law. 34 (1): 219. Archived from the original (PDF) on 4 March 2016. ^ Dhamija, Dr. Ashok (2007). Need to Amend a Constitution and Doctrine of Basic Features. Wadhwa and Company. p. 568. ISBN 9788180382536. Retrieved 17 June 2014. ^ a b aDvantage. "Doctrine of Basic Structure – Constitutional Law". www.legalserviceindia.com. Retrieved 26 January 2016. ^ Jacobsohn, Gary J. (2010). Constitutional Identity. Cambridge, Massachusetts: Harvard University Press. p. 52. ISBN 9780674047662. ^ a b Dalal, Milan (2008). "India's New Constitutionalism: Two Cases That Have Reshaped Indian Law". Boston College International Comparative Law Review. 31 (2): 258–260. Retrieved 5 March 2015. ^ Mehta, Pratap Bhanu (2002). Hasan, Zoya; Sridharan, E.; Sudarshan, R. (eds.). Article – The Inner Conflict of Constitutionalism: Judicial Review and the 'Basic Structure' (Book – India's Kiving Constitution: Ideas, Practices, Controversies) ((2006)Second Impression (2002)First ed.). Delhi: Permanent Black. p. 187. ISBN 81-7824-087-4. Retrieved 9 November 2015. ^ Bhattacharyya, Bishwajit. "Supreme Court Shows Govt Its LoC". the day after (1–15 Nov 2015). Archived from the original on 5 May 2016. Retrieved 10 November 2015. ^ National Comionmission to Review the Working of the Constitution. "A Consultation Paper on the Financial Autonomy of the Indian Judiciary". Chapter 1. New Delhi (26 September 2001). Retrieved 5 November 2015. ^ Chakrabarty, Bidyut (2008). Indian Politics and Society Since Independence: Events, Processes and Ideology (First ed.). Oxon(UK), New York (USA): Routledge. p. 103. ISBN 978-0-415-40867-7. Retrieved 5 November 2015. ^ Sorabjee, Soli J. (1 November 2015). "A step in the Wrong Direction". The Week. Retrieved 12 November 2015. ^ Venkatesan, V. (10–23 March 2012). "Three doctrines". Frontline. Vol. 29 no. 05. ISSN 0970-1710. Retrieved 26 July 2018. ^ Jain, Mahabir Prashad (2010). Indian Constitutional Law (6th ed.). Gurgaon: LexisNexis Butterworths Wadhwa Nagpur. p. 921. ISBN 978-81-8038-621-3. OCLC 650215045. ^ Lectures By Professor Parmanad Singh, Jindal Global Law School. ^ Jacobsohn, Gary (2010). Constitutional Identity. Cambridge, Massachusetts: Harvard University Press. p. 57. ISBN 978-0674047662. OCLC 939085793. ^ Chandrachud, Chintan (6 June 2015). "India's deceptive Constitution". The Hindu. N. Ram. ISSN 0971-751X. OCLC 13119119. Retrieved 26 July 2018. ^ Raghavan, Vikram (2010). "The biographer of the Indian constitution". Seminar. Retrieved 13 November 2015. ^ Dharmadhikari, Justice D. M. "Principle of Constitutional Interpretation: Some Reflections". (2004) 4 SCC (Jour) 1. Retrieved 6 November 2015. ^ Gaur, K. D. (2002). Article – Law and the Poor: Some Recent Developments in India (Book – Criminal Law and Criminology). New Delhi: Deep & Deep. p. 564. ISBN 81-7629-410-1. Retrieved 9 November 2015. ^ Narain, Vrinda. "Water as a Fundamental Right: A Perspective from India" (PDF). Vermont Law Review. 34:917: 920. Retrieved 9 November 2015. ^ Khosla, Madhav (2011). "Making social rights conditional: Lessons from India" (PDF). I•con (2010). 8 (4): 761. doi:10.1093/icon/mor005. Retrieved 10 November 2015. ^ Khanna, Hans Raj (2008). Making of India's constitution (2nd ed.). Lucknow: Eastern Book Co (published 1 January 2008). ISBN 978-81-7012-108-4. OCLC 294942170. Khanna, Justice H.R (2015). Making of India's Constitution (2nd Edition 2008, (Reprinted 2015) ed.). Eastern Book Company. ISBN 978-81-7012-188-6. Austin, Granville (1999). The Indian Constitution: Cornerstone of a Nation (2nd ed.). Oxford University Press. ISBN 978-01-9564-959-8. Austin, Granville (2003). Working a Democratic Constitution: A History of the Indian Experience (2nd ed.). Oxford University Press. ISBN 978-01-9565-610-7. Baruah, Aparajita (2007). Preamble of the Constitution of India : An Insight & Comparison. Eastern Book Co. ISBN 978-81-7629-996-1. Basu, Durga Das (1965). Commentary on the constitution of India : (being a comparative treatise on the universal principles of justice and constitutional government with special reference to the organic instrument of India). 1–2. S. C. Sarkar & Sons (Private) Ltd.
Basu, Durga Das (1984). Introduction to the Constitution of India (10th ed.). South Asia Books. ISBN 0-8364-1097-1. Basu, Durga Das (1981). Shorter Constitution of India. Prentice-Hall of India. ISBN 978-0-87692-200-2. Das, Hari Hara (2002). Political System of India. Anmol Publications. ISBN 81-7488-690-7. Dhamija, Dr. Ashok (2007). Need to Amend a Constitution and Doctrine of Basic Features. Wadhwa and Company. ISBN 9788180382536. Jayapalan, N. (1998). Constitutional History of India. Atlantic Publishers & Distributors. ISBN 81-7156-761-4. Khanna, Hans Raj (1981). Making of India's Constitution. Eastern Book Co. ISBN 978-81-7012-108-4. Rahulrai, Durga Das (1984). Introduction to the Constitution of India (10th ed.). South Asia Books. ISBN 0-8364-1097-1. Pylee, M.V. (1997). India's Constitution. S. Chand & Co. ISBN 81-219-0403-X. Pylee, M.V. (2004). Constitutional Government in India. S. Chand & Co. ISBN 81-219-2203-8. Sen, Sarbani (2007). The Constitution of India: Popular Sovereignty and Democratic Transformations. Oxford University Press. ISBN 978-0-19-568649-4. "The Constituent Assembly Debates (Proceedings):(9th December,1946 to 24 January 1950)". The Parliament of India Archive. Retrieved 22 February 2008.